mezla and 3 Guests are viewing this topic. 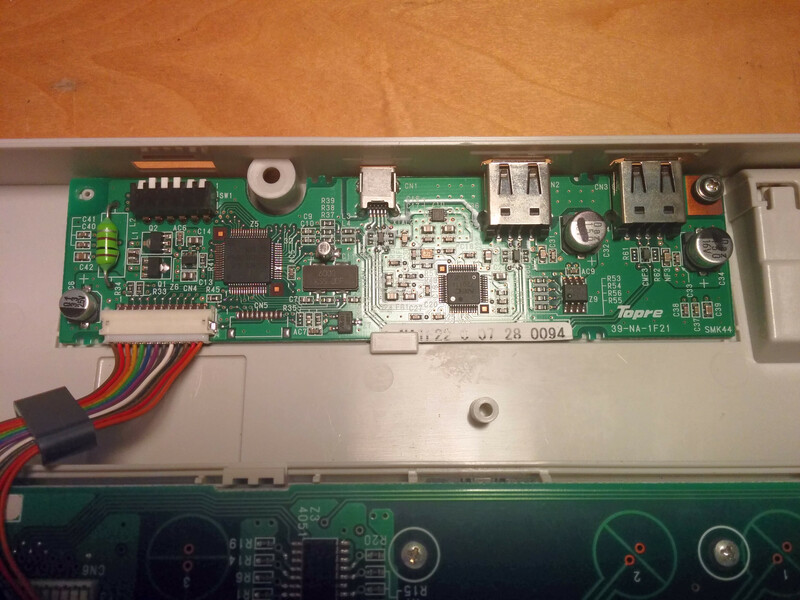 This controller board replaces stock controller and makes your HHKB full programmable. 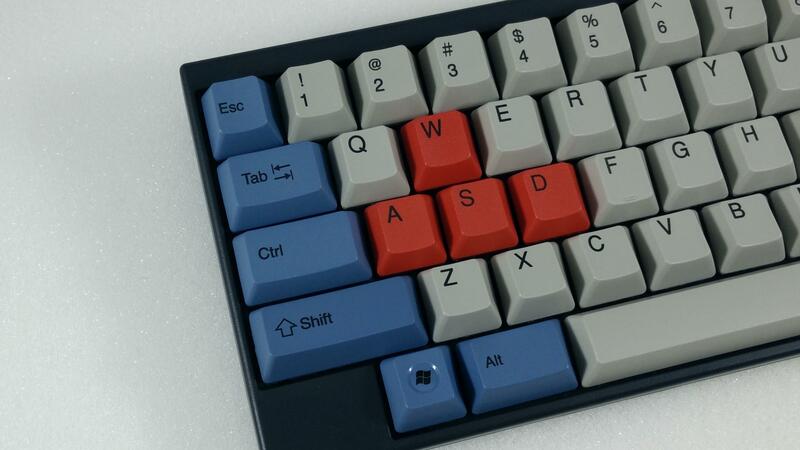 This board is fully assembled and you can install it into your HHKB only with screw driver. HHKB Pro1(PD-KB300), HHKB Pro2(PD-KB400) and HHKB ProJP(PD-KB420) including Type-S are supported. Note that HHKB ProBT(PD-KB600/620) is NOT supported. Bluetooth and USB controller look like these. Note: In current revision pcb color is green. Battery is not included. Feel free to post your question or suggestion here! I basically prefer to discuss here to share info with community rather than email. 2014/05/01 GB was closed and moved to artisan service. 2015/08/22 components for next batch were ordered, it will take a few weeks to be delivered. 2015/10/07 All components are stocked for all variants now. 2017/04/28 All variants are virtually always in stock. 2017/06/06 Added note for shipping to Canada. 2018/09/08 Shipping to Canada is no problem now. Removed caveat. See this photo, black one is ProJP model and white is Pro2. As you can see ProJP bottom case has no hole for switch and LEDs. 2) you can use Pro2 bottom half with ProJP top half as the photo indicates. 2. Japanese specific keys cannot be sent via Bluetooth. You can remap them to other normal keys. This won't be critical to other language users. See also LIMITATION section below. NOTE: Bluetooth controller has all functions of USB controller, no compromise as USB controller. NOTE: This controller doesn't support "HHKB Professional BT"(PD-KB600/620). All variants are virtually always in stock. 0. Read this post carefully and feel free to ask me if you have any question before placing an order. 1. Email me to let me know which variant of controller you want. 2. I'll send invoice mail via PayPal in a few days. 3. Make a payment within seven days. Please supply correct shipping address on PayPal when the payment. 4. You will receive an email with tracking number from Japan Post after shipping. Let me know if you don't get tracking number in three bussiness days after payment. You can trace it here or your country's postal service like USPS. For example, it costs 48USD(42+6) in total for an USB Controller and 164USD(79*2+6) for two Bluetooth Controller. Paypal Invoice will be sent to your email. You'll be able to make a payment with credit card on Palpal even if you don't have Paypal account. World wide shipping at same rate 6USD. Registered Small Packet with tracking and insurance. PLEASE TEST IT BEFORE FLASHING YOUR OWN FIRMWARE. Just install it and check if you can type on your keyboad normally. WARN: PLEASE MAKE SURE BATTERY POLARITY BEFORE CONNECTING. Some batteries in the market has reverse polarity at connector and it will fry and break battery charger chip. With the broken charger chip you cannot charge battery fully anymore or controller may stop working completely. I can offer free repair service for faulty charger chip but you have to pay postage for both ways. No RMA service is provided for this, sorry. Positive(+) side or red wire should be on left as the pic shows. See "Bluetooth Battery" section below for more info. Get battery from reliable srouces like sparkfun or adafruit if you are not sure. 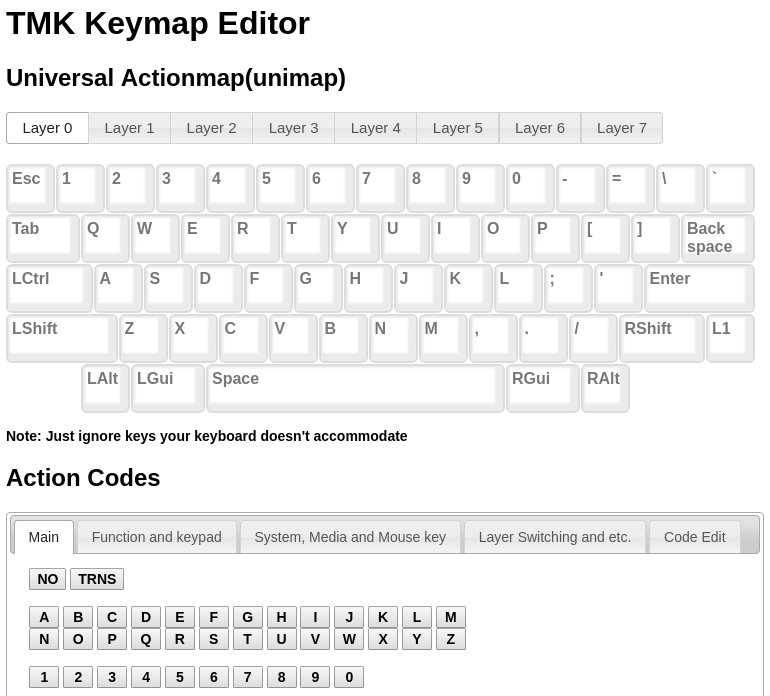 You can remap keys and download firmwre using TMK keymap editor on web browser. Please use Chrome if you have any problem on other browser. 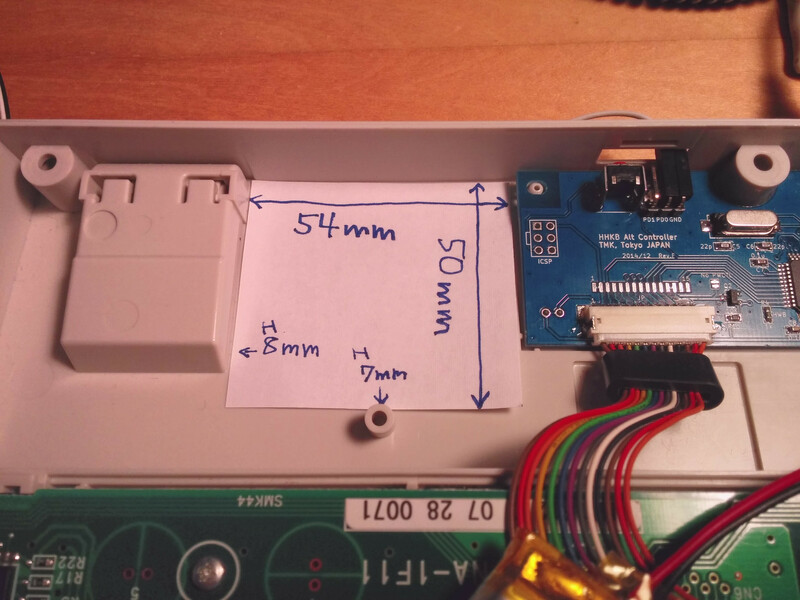 See 'MANUAL' section below for how to flash firmware onto controller. NOTE: Use proper link to download firmware for your controller. There are four diffrent variants and they are incompatible each other. Use KEYMAP EDITOR to download compiled firmware unless you have specific need. Firmware source code is available under GNU General Public License. To build firmware from source code consult documentation there. TMK firmware offers various features including key mapping, mouse keys and USB NKRO. You can switch the two connections with slide switch or key combination. You can change power/connection configuration of the module if needed. Red LED turns on when low voltage. LED indicates status of Bluetooth connection. The module stores up to 8 connections. The module connects the last connected device automatically. works as keyboard with iPhone5. No tested completely. Note that iOS doesn't accept mouse device. works as keyboard and mouse with Nexus5. No tested completely. You can charge from USB port or power adapter which has USB outlet. Bluetooth module RN42 cannot send HID keyboard usage more than 0x65. This won't affect most of latin language users. USB controller can send all usage. It can't send Power, Wake and Sleep keys. Controller has no USB Hub fucntion, you lose two USB downstream ports and they turn into just two empty holes on HHKB Pro2. Around 12 hours with 850mAh. Around 30 hours with 2600mAh. 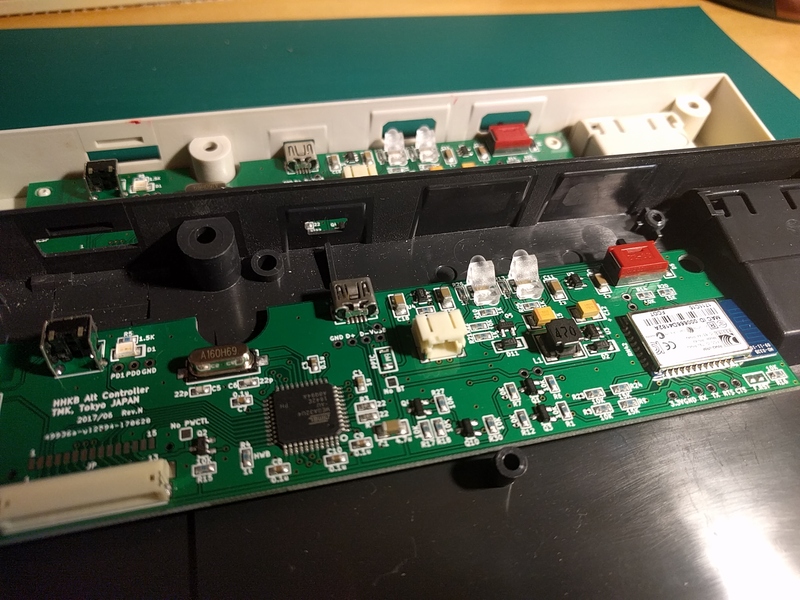 BT Controller needs to use battery power to scan HHKB key matrix and get minimum latency on Bluetooth. If you don't mind slow scan rate and latency you can make battery life a little longer but not so much, HHKB and the module is power hog in the end. Lipo battery is not included. And it cannot be shipped from Japan due to regulations. You have to purchase battery for BT controller, see Bluetooth Battery section below for the detail. TAKE EXTRA CARE OF YOUR SAFETY AND PROPERTY. You can learn here. Key strokes from Bluetooth are ignored by default. To make Karabiner recognize them enable option 'Allow devices which Vendor ID and Product ID are zero.'. USE AT YOUR OWN RISK. I can not be liable for any damage. NO FRIENDLY CUSTOMER SUPPORT. You are required to teach yourself first. NOT PROFESSIONAL JOB. I'm not a professional. NOT LEAD FREE. I use leaded solder to assemble. - No plan for USB-C C is a bit too large to plug in USB-mini hole. The name 'TmkBT-XXXX' is stored actually in Bluetooth module RN42 and you can change 'TmkBT' part while '-XXXX' part is not configurable and it is last 4digits of bluetooth address. You can change this line, build and upload firmware. You can change the name by editing this line then build and upload firmware. And you have to initialize RN42 module with LShift+RShift+ScrollLock(Fn+O). The intialization is nedeed just once after firmware is updated. Refer to 'MANUAL of Bluetooth Controller' below. TMK firmware supports the controller and provides various features for the keyboard. You can use the features fully by building your own firmware from source codes. See following links for the detail. Design files, source codes and the detail of the controller are available. First of all, Use default firmware to test your hardware. Note that there are four variants of fimware. Dowload proper firmware from Keymap Editor and flash it when you are in trouble. Your Bluetooth controller doesn't work on Bluetooth while does on USB? You may be using firmware for *USB* controller(not Bluetooth) perhaps. With the wrong firmware Bluetooth controller works completely on USB while it doesn't register any keys on Bluetooth but you can still pair with computer though. Use proper Bluetooth firmware for your controller, download it from Keymap Editor you can find above. Have bluetooth trouble in MacOS? First, make sure you have correct firmware for Bluetooth controller, see entry above. Try removing '~/Library/Preferences/com.apple.Bluetooth.plist', '/Library/Preferences/com.apple.Bluetooth.plist' or both then reboot your Mac. You will have to do pairing process with all your devices again after this. This seems to be common solution for bluetooth trouble on MacOS. Refer to following links as well. Post your problem and solution on this thread and share with the community! You can try HHKB keymap editor first. You can download pre-build firmware after editing your keymap. Some features are not available but it is easy to use. If Keymap Editor is not enough it is time to edit source codes and build firmware yourself. You can use dfu-programmer or Atmel FLIP to program microcontroller on the board. To get controller into bootloader(program) mode you can push red button on back or press key combo "LShift+RShift+Fn+P(Pause)" with default keymap. Microcontroller of board is Atmel ATMega32u4. There is good instruciton video. Thank you Tech Intake! 1. Unscrew three bolts on bottom and open case carefully not to damage cables. 2. 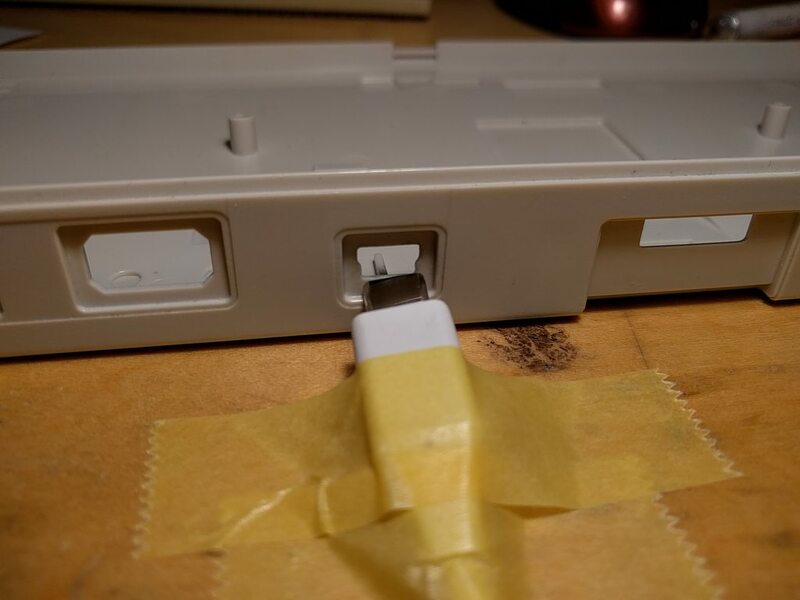 Unscrew bolt at top right on board first and then unmate connector to remove original board. Note that you don't need any tool to unmate. See this. 3. Mate with connector of Alt board firmly and screw. For Bluetooth: Also connect Lipo battery to board. Battery should be fixed with double sided adhesive tape or something but too strong stickyness may deform and damage battery when you remove it. 4. Close case and scew bolts. Make sure ferrite core on cables are placed right position like pic above beore screwing, otherwise It won't close decently. This turn on Bluetooth function of controller and switch keyboard into Bluetooth mode. When this switch is off keyboard works in USB mode. It lights red when Bluetooth is connected to host, blinks red(once per second) when waiting for connection and blinks red(10 times per second) when Bluetooth module is config mode. When keyboard are powered with USB it lights green if battery is fully charged or ligths red if charging. And it lights red to alarm for low battery when not powered with USB. Lipo battery can be charged when keyboard is powered with USB cable. You can power it with USB port on PC and 5V USB power adapter. Charging battery with low voltage takes long time or can't charge full. Note that cheap or unpowered USB hub may not be able to supply enough power. You can connect keyboard with OS specific method during red BT LED is blinking. You can make up to eight pairing with different hosts, according to manual of RN42. You cannot pair with new host during keyboard is connected to a host. To pair with new host you have to disconnect by turning off the host's Bluetooth radio, removing pairing info from the host, keeping away enough to make its radio unreachable or use magic command 'p' to remove pairing info from keyboard. Keyboard is automatically connected to host once pairing process is done. Keyboard is always connected host to which keyboard connected last time. This means you can't connect keyboad to other hosts when the last host are in reachable range. In this case you will have to make keyboard into pairing mode forcibly using magic command 'p' and redo pairing process. Prefix of magic command are LShift + RShift. - i displays Bluetooth information on hid_listen console. - b displays battery voltage on console. - Delete enter/exits Bluetoot module RN42 config mode on console. See RN42 manual. - Scroll Lock initializes module with TMK default configuration. - p put keyboard into pairing mode focibly. Note that this removes all pairing infos. - u switches between USB and Bluetooth mode. You can initialize module when you are in trouble. But you should tarke care to prevent module from being cofigured incompletely or wrongly. Take the following steps. 0. Turn BT swich off and unplug USB cable. 1. open hid_listen. You can do without it but I recommend. 2. Plug USB cable and wait for keyboard to startup. 3. Press key combo LShift+RShift+ScrollLock(Fn+O). 4. Turn BT switch on. You will see output below on hid_listen. 5. Do not touch keyobard until the command completes or for twenty seconds. Now module is configured with default setting and in pairing mode. You may need extra power cycle for pairing, try BT switch off and on. Output on hid_listen from initialize command. You need hid_listen to access this mode. You can change configuration of Bluetooth module with this. Don't change baud rate! Never! 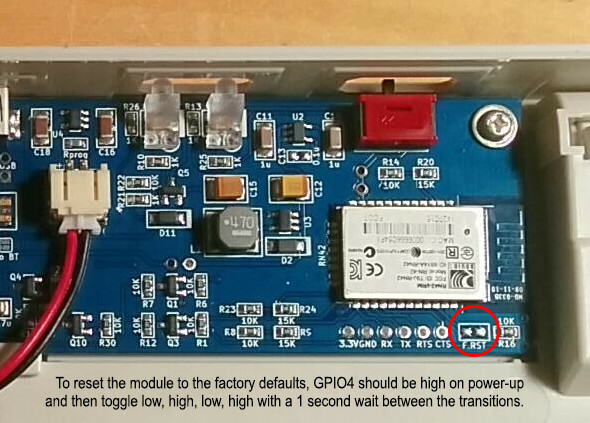 Firmware will lose access to the modlue and you need to communicate to the module with 3.3V UART adapter hardware to fix this problem. This may brick your Bluetooth module. Read all documents of RN42 before do this. DO NOT USE IF YOU ARE NOT SURE. See this for configuration commands. When you make a mess of the module configuration you can do Factory Reset. This resets the module factory default settings. power-up and then toggle low, high, low, high with a 1 second wait between the transitions. You can toggle GPIO4 with two pads labeled as "F.RST" in pic below. You can turn it high(ON) by closing the pads with tweezer, paper clip, or screwdriver and low(OFF) by keeping open. After reset you have to initialize the module to use it as Bluetooth keyboard. Bluetooth Controller doesn't include battery. I confirmed Sparkfun Lipo battery(850mA and 1000mA) but you will be able to find proper batteries at many sites on the net. 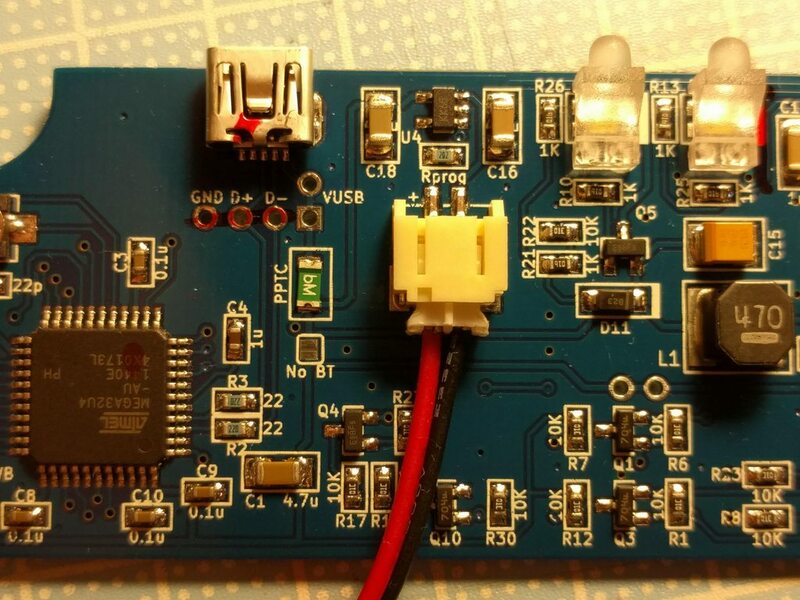 You need to use 3.7V Lithium Ion Polymer battery with JST PH 2pin connector and battery protection circuit. 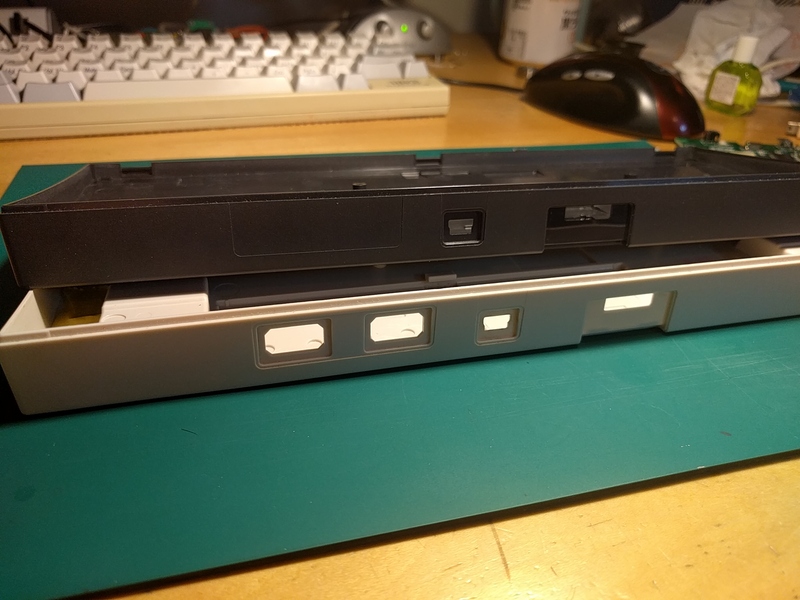 Battery space inside HHKB is around 54mm x 50mm and its height is 7mm(or 8mm). - Sparkfun 2000mAh - https://www.sparkfun.com/products/8483 Not fits. It does not fit in the space basically. Warn: either way, do it at your own risk, of course. Note that you will need to rewire and crimp JST PH connector yourself. Note that some battery connector has reverse polarity. It will fry battery charger chip. Left side should be red wire or positive(+) of battery when plugged as this pic shows. LIPO BATTERY IS VERY DANGEROUS, TAKE EXTRA CARE OF YOUR SAFETY AND PROPERTY. For your safety check this. First of all, much Congratz on your well deserved artisan thread hasu! Thanks for your interest, FoC_Tow. No waiting list anymore. Basically I'll make some boards if I have time and retain some extra preassembled controllers for immediate shipment. Currently two USB controllers and one BT controller are in stock with preassembled and tested. They can be shipped in a few days. I have also components for 10+ USB and 4 BT controllers so that those can be assembled to meet further orders. Probably lead time will be less than a week. I think with some work we can get power saving and battery good enough to last weeks. Switching hosts would be nice too. These sound like they might take a while. So I figured if I really need the BT, maybe just use an external for a while. Fwiw since FoC_Tow was debating options. Thanks again! The bluetooth module works flawlessly. If anyone is interested in buying a USB only PCB please let me know! PM me or check out the post I just posted in the for sale section of Geekhack. Do you have an alternative to MHV AVR for the compiler? The link appears to be dead. There are versions out there but the one I tried gave me errors when I tried to compile my hex file. You can download GCC compiler from Atmel site. I'll update that link and description of how to install on WIndows later, thank you. Thanks! I got it working. On the cygwin install, which packages are needed? Probably you need 'make'(under Devel category). I think other general commands are already installed from the begining, like 'sh', 'cp', 'rm' and 'rmdir'. Just installed my controller but have a slight bulge in my case despite screwing it back in and clips being seemingly engaged. There is a plastic Ring around the ribbon cable, where abouts should this sit when folding the cable up against the PCB, the middle? Still waiting until I move into my new place before I play with the BT Controller. Quick question for Hasu: will it still work in USB mode without a battery, or should I make sure I have the battery already when it comes time to install? Yes you can use BT Controller safely without battery. USB mode works of course and also BT mode works during you give it power with USB cable. thanks for your project. i'm a newbie with hhkb. i will receive my hhkbpro2 direcly from pfu-direct. my friends told me to see your post for modding my hhkb. i just have some questions, your board helps a default firmware and you says that it can be remap easily. my question is when i remap it on the sites, i download the firmware, how can i loaded it to the board ? You can use dfu-programmer or Atmel FLIP to flash(program) the cotroller. The former is command line tool while the latter is GUI application runs on Windows. When shipped I configured RN-42 to auctoconnect. It should autoconnect if host OS allows. Mac OS X. The last board I had from you autoconnected just fine. How would I go about configuring it? I saw the rn42 doc but I don't think anything happens when I hit Left Shift + Right Shift. Also, the whole debugging menu and stuff, how are you supposed to access that? I thought I would just open a notepad, and it would start typing the prompt... no? No, Notepad is not useful to TMK, you have to use PJRC hid_listen command. To get help message press LShift+RShift+h. You can initialize the module with default setting by pressing LShift+RShift+Scroll Lock. You may have to do this twice. You can also enter config mode of RN-42 with LShift+RShift+Del but I don't recommend this unless you read its data sheet carefully. You can brick the module accicentaly. You can't autoconnect, but can you connect it by hand? how do you connect it? It works when I initiate connection from the laptop to the keyboard. SR,Z // removes all remote addresses for reconnecting. Maybe I have to turn on SM,6? SM,6 did the trick. It is now autoconnecting!!! EDIT: So after I fixed everything, I figured why not give it a shot reconfiguring from scratch. Got everything to look good, however, about every 5-6 seconds or so, the keyboard disconnects/reconnects to bluetooth. Any idea which configuration that might be? EDIT2: Main difference is HID Class 0000 (keyboard) instead of (003C) because I don't plan on using mouse functions. Are you tring to optimize module configuration yourself, just for fun? Or even with default configuration do you have any problem? This was with rn42 turned to default and changed the settings mentioned above. Should it be SM,4 or SM,6 by the way? OK. First, you should revert to TMK default configuration. 4. Press LShift+RShift+Scloll Lock(in fact, LShift+RShift+Fn+o) to initialize the module to default setting. 5. Turn the BT switch on. 6. Just see output on hid_listen. This takes several seconds, don't touch any keys till all commands settles. You should get exact same following output. If you see corrupt output do above procedure again. Then, do pairing on your host again from the begining. With Google search I found some people are saying PRAM clear and SMC reset cured their Bluetooth problems for some reason. Did you try those yet? It should be 'SM,4' . I don't remember how 'SM,6' works, to be honest. Compiled the latest, and threw it onto the board. Did a lot of testing. This is what I found out. If you use SH,0000 (HID for Keyboard), it will do this 5s reconnect cycle. The only way to avoid this is to use 003C for Keyboard and Mouse. I would consider this a bug. Not anything critical, however, SH,0000 should work because with SH,0000 the BT Host's operating system has specific functionality for dealing with just keyboards. Also can you elaborate on SY,FFF4 vs SY,0004 ? Which transmit power is higher? I'd like a lower one that consumes less power (longer battery life). I read module documentation again and found some clues. As you said 'SH,0000' will work with some mode(SM,6?) but TMK expects the module is working with 'Auto-conect with DTR' mode(SM,4) and use this to disconnect Bluetooth link to host in some situations. paired devices to which the module can recon-nect." and "bit 3 Send output reports over UART.". The bit 3 is required to control capslock LED on board but not ciritical, but I guess bit 2..0 causes your auto-connect problem. Use FFF4 for low transmit power. I think you already download and read this but just for others interested. Hey Hasu, because your controller doesn't have the USB hubs like the stock controller does, would it work when plugged in an ipad via the camera adapter? Have you tested it? I think so but not confirmed with Apple camera adapter and the latest iOS. I don't have a genuine cable to test. I tested my controller with cheap adapter clone and old iOS and it works as keyboard. But the clone cable became unusable sometime ago after iOS update. You have to use USB controller, BT controller will not work due to battery charger. Maybe this is obvious to those who have iPads - but what do you mean about the battery charger preventing BT under iOS? Also, any luck in knocking out that Windows guide? I found the compile relatively straightforward under Linux, but keep getting errors with cygwin+Win64. And regardless, let me repeat my many thanks for all your time and hard work - this controller rocks. Of course BT controller can be used with iOS via Bluetooth without problem because bluetooth module RN-42 supports the OS. But I'm not sure BT controller works as an USB keybaord with iPad/iPhone when connected using 'Apple USB Camera Adapter'. Seems like whether it works or not depends on its power consumption. So I think BT controller may not work particularly when it is charging. Are you using Cygwin64? I'm not sure this is importnat but I still use 32bit Cygwin and Atmel Toolchain(win32) on WIndows7 64bit. I ordered the BT controller tho, are you saying that it won't work at all when plugging into ipads? Can you not "disable" BT mode and have it in USB mode? But I'm not sure BT controller works as an USB keybaord with iPad/iPhone when connected using 'Apple USB Camera Adapter'. Seems like whether it works or not depends on its power consumption. 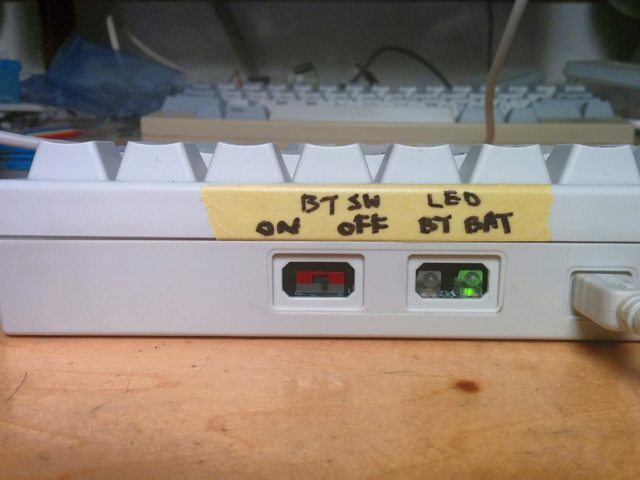 So I think BT controller may not work particularly when it is charging. You get an error that the device is not supported, but it works! Great news! ...I've sent a PM. OK so I found out that the keyboard works with IPads when plugged in with usb camera adapter if the battery is not attached, might as well use it wirelessly lol. BTW what is the red button for under the dip switch cover? Any solution for the delay in toggling the L1 layer? Was going to push delete to that layer, but as soon as I did the delay became infinitely more bothersome. Tried reflashing firmware on a different computer using Flip and the problem is still there. It is program button to upload firmware to keyboard. I don't know what you are saying without your keymap. 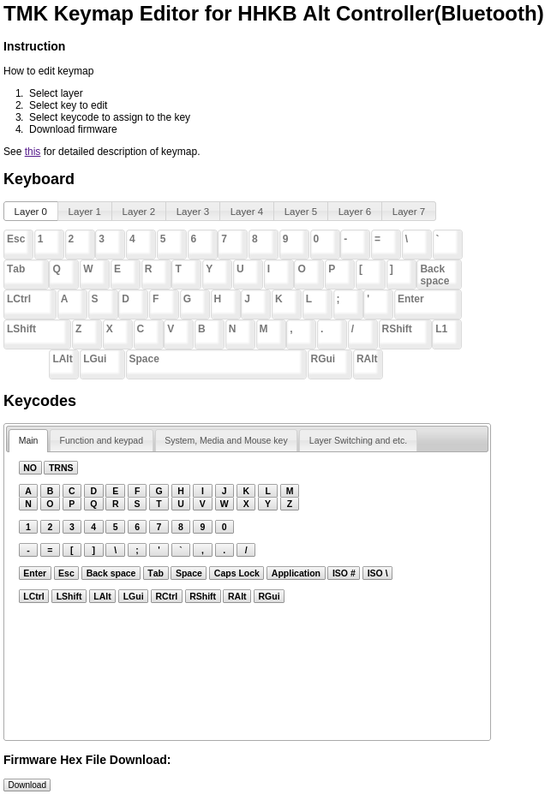 Post your keymap code or URL if you are using keymap editor. Hmm, your keymapping is simple and plain it seems to work well without delay. "toggling"? L1 is for momentary layer switching. If you want to toggle layer you have to use T1 in TMK keymap editor. "Was going to push delete to that layer, but as soon as I did the delay became infinitely more bothersome." I can't sitll under stand your problem, maybe due to my poor Engrish skill. Can you explain it again with plain English? this is the same problem i described in the old thread (hoffman had it too). basically when you press the key to switch to momentary layer 1, and then press a key with an assigned layer 1 action immediately after (example: [;'/ assigned to arrow keys), there's a ~50ms delay in the key input being recognized by the OS (windows 7 64 bit in my case). if you maintain your press on the momentary layer 1 key, but then continue to press other keys on the layer (so you keep Fn held down and press [ repeatedly to move left), there is no further delay in the recognition of the presses after that. so it just seems like there is a delay in the initial switch to L1. Ah, thanks for reminding me, I couldn't remember that problem at all for some reason dumb, my short memories! I filed the problem in github issue tracker and fixed it at this commit of Apr 23. If you build firmware from the latest sources you don't suffer from this problem anymore. But I didn't update Keymap Editor and default firmware used when shipping yet. good stuff . i'll try and figure out how to build firmware without using the keymap editor hex sometime today and let you know the results. thanks much for your work hasu! Hasu, I love the controller! It's great. I miss the USB hub: it was very useful for connecting second keyboard, trackball or numpad while keeping wires tidy. Would you consider adding USB hub in the next version? Or maybe a second board as an add-on unit? Not sure I can design controller with USB hub, but I know some people need it certainly. I for one don't use keyboard hub function and don't have motivation to develop the feature unfortunately. But I'll look into USB hub design when I have time. I don't quite understand how to use the Boot Magic / Virtual DIP switches correctly. Is there a site that explains in detail what to do? For example, I would like to use this to program my controller instead of using the button, but my attempts are unsuccessful. Any tips? Just press space and b key during pluging in to start bootloader. BootMagic works only if your firmware is sane and built with enabling BootMagic option. When you have trouble with firmware use hardware program(reset) button. I'm sorry to ask, but has anybody got the full list of fixes and how to complete them so I can make my rev D's bluetooth module work? Old GB thread has PCB revision history and info fof BT fixes. I'll add those infos in the first post fot this thead too.